Numbers are neither difficult to understand nor it is difficult to manipulate only if teachers are able to impart confidence in students by making it interesting for them to learn. The bulk of responsibility to make mathematics attractive to children rests with teachers. Teachers should first love the subject and be able to proliferate it through their actions that children could witness as live demonstration. This is when they realize how easy it could be to grasp the numbers that seemed quite faraway objects earlier. How mathematics can be taught effectively has been discussed in this article. The better you are aware about why to teach mathematics, better you are placed to teach it effectively. Mathematics is wound around our daily lives and most life skills require the knowledge of mathematics. Students have to be imparted the knowledge in a way so that they can make use of numbers and the processes to understand many more information that surrounds their lives. Whether you are teaching mathematics in school or giving home tuition the goals of teaching are same. Clarity of goals will lead you to innovative ways to teaching that generates interest and drives away inhibitions of students that surround the subject. The numbers that are seen on the surface convey different meanings depending on how it is made use of. 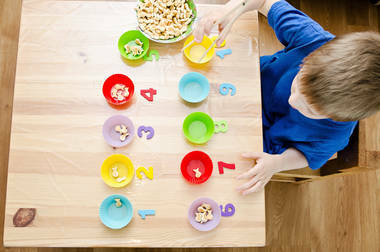 Numbers are manipulated to define some mathematical concept that is illustrated by some defined procedures. Children have to be told about the concept that is being taught. This means that they have to be taught about why 2x2 makes 4 or why 3+3 makes 6. At the same time they have to be taught about the processes which are the ways numbers have to be added, subtracted, multiplied and divided. This would explain how it happens. Children have to understand why it happens and also how it happens. This would lend clarity about both the concept and the process so that students can make some sense of it. While it is important to ensure that students are able to grasp the process of doing mathematics it is even more important to make them understand the various concepts that make things happen. Keep asking them about why some things work and why other does not. Unless a student has clarity about why and how numbers work, they can never enjoy the hidden treasures of mathematics that can make it attractive to them. Never be bound by the correct answer only but stress on what has been done right in the process. This would help to identify the strength and weakness of students that has to be worked upon. Impart confidence in students by stoking their creativity by allowing them to practice some mental mathematics in explaining and solving problems. This would make them feel more confident and develop a sense of meaningful association with the subject and make them feel like mathematicians. Teachers have to be more sensitive and innovative to make mathematics lovable to students.